Well what a lovely surprise! I have been nominated for the Versatile Blogger Award not once, but twice! Firstly I was nominated by my twitter friend and reader Ellie from Emerald Pie and secondly by the lovely Janice at Farmergirl Kitchen. Thank you so much to both of you. 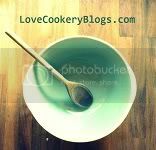 I have been blogging for about nine months now and started off just using the blog as an online portfolio and scrapbook for my recipes and craft tutorials. For a little while I got caught up in worrying about stats, trying to post everyday and keep up with some of the top bloggers. It was beginning to feel like a second full time job. I have stepped back a little and just focussed on the blog as being a space for me to share my ideas and I am really enjoying it. Above all I am really happy to have met some lovely people that share the same interests as me in the webosphere. 2. Say 5 random facts about you. 4. Let the blogger know about the nomination. I am a massive fan of US drama including, The West Wing, Mad Men, The Wire, Good Wife and CSI. I love going to the gym. Spin class is my chill out time and helps burn off the cake! I work better in a sunny environment. I have a big weakness for dark chocolate. Amy at the Weekly Bake Off. Amy is working her way through Mary Berry's 100 cakes and bakes and letting us all join in and compare our baking experiences. Nelly at Nelly's Cupcakes who is always cooking up something super scrummy. Becky has just started her blog at Unapologetically Becky and as well as being my latest baking friend she does lots of brilliant crafting and makes the most gorgeous doorstops. Leila at Persian Living who blogs her very tasty Persian traditional recipes. Fiona at London Unattached who writes about her life in London, balcony gardening, cooking and things out and about in London. Thank you once again for my nominations!